This all day road trip will amaze you. First a trip over Snoqualmie Pass and Blewett Pass, then see apple and cherry orchards. 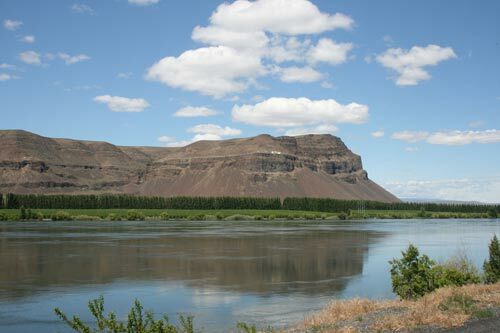 Travel up the hill above the Columbia River and witness first hand the scab-lands of Central Washington (barren land), with sage brush, then wheat fields. Next, amazing Dry Falls and the coulees. Then dip your foot in Soap Lake, with so many minerals, the water feels like there is soap in it. Note: Dry Falls was probably the largest waterfall in the world in it’s day, falling nearly 400 feet, and over 3 miles wide. On this tour you’ll see one of Washington’s Seven Natural Wonders; the remnants from massive ice-age flooding. Pacific Northwest Geology, we've got plenty of wondrous terrain! This geology tour takes you back thousands of years, about 15,000 in fact, and you'll see terrain that took a geologist nearly 20 years to prove to his colleagues; how massive flooding over several thousands of years re-shaped the Columbia Plateau. Also called the Columbia Basin, this area is labeled the Scablands, because of the scars that remain in the topography. This tour is full of excitement as you make your way to Eastern Washington, then see the coulees themselves, formed during the flooding. We'll stop for lunch and dinner, and have plenty of rest breaks.